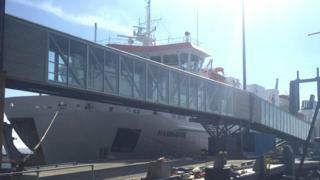 Engineers in Orkney are investigating what caused a failure of the passenger walkway used to get on and off a ferry. The Stromness walkway - for the Serco NorthLink ferry Hamnavoe - suffered damage after an apparent failure of its control system earlier this month. Foot passengers, including anyone with mobility issues, are temporarily boarding the vessel through its bow door - normally only used by vehicles. It is understood the equipment could take many weeks to repair. The walkway is owned and operated by Orkney Islands Council. Graham Sinclair, the chairman of Orkney Islands Council development and infrastructure committee, told BBC Radio Orkney: "The system failed to respond to the over-drive controls, and it was a sort of self-destruction, if you like. "It caused significant damage by trying to extend too far. "It's specialised kit, so any replacements will have to be made to order. I would really hesitate to give any estimate of the expense other than to say it will be very expensive."